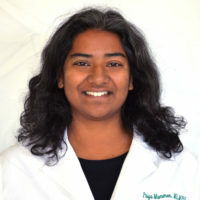 Priya Mammen is an emergency physician and public health advocate. After graduating from Tufts University with a Bachelors of Science in Biology and Child Development in 1997, she worked with John Snow, Inc and the US Agency for International Development (USAID). She was engaged in health systems development in war-torn countries, such as Cambodia, and specifically focused on the integration of reproductive health services to the community health infrastructure by facilitating interagency collaborations. Dr. Mammen completed a Masters in Public Health at Johns Hopkins Bloomberg School of Public Health and her medical education at Temple University School of Medicine. She completed her residency training in Emergency Medicine at Temple University Hospital. Her research interests include Emergency Department utilization by the medically underserved and as a point of access to care. Interagency work has continued throughout her academic career, involving the American Public Health Association (APHA), the Philadelphia Medical Examiners Office, Region III Substance Abuse and Mental Health Service Administration (SAMHSA) and the Pennsylvania Overdose Prevention Task Force. She facilitated ED-based public health initiatives within Jefferson Health, such as safe opioid prescribing guidelines, overdose prevention and education, integrative services for patients experiencing homelessness, and HIV and Hepatitis C screening as Director of Public Health Programs. She was appointed to the Mayor’s Task Force to Combat the Opioid Epidemic in Philadelphia and also served on the subcommittee for Service Access, Best Practices and Treatment Providers. Dr Mammen was inducted as a Fellow of the College of Physicians of Philadelphia in 2015 and was subsequently elected to the Executive Committee of the Section of Public Health and Preventative Medicine. She was named a Fellow of the Lindy Institute of Urban Innovation with a focus on urban resilience. In 2018, she joined the Board of Directors of Pathways to Housing PA and was invited as a speaker for TEDx West Chester (watch her talk here:https://bit.ly/2zTcK4s). Dr. Mammen's career is marked by the consistent application of her experience and perspective as an emergency clinician to serve the well-being of her patients on the spectrum from individual to population health.